His important new book offers a definitive account of how much the Allies knew regarding the mass murder of Jews at Auschwitz during the Second World War. 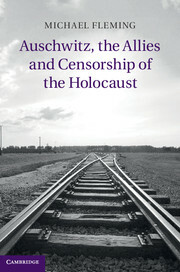 By tracking Polish and other reports about Auschwitz from their source, and surveying how knowledge was gathered, controlled and distributed to different audiences, the book examines the extent to which information about the camp was passed on to the British and American authorities, and how the dissemination of this knowledge was limited by propaganda and information agencies in the West. In a fascinating new study, the author reveals that the Allies had extensive knowledge of the mass killing of Jews at Auschwitz much earlier than previously thought; but the publicising of this information was actively discouraged in Britain and the US (*). The first part of his talk, prof. Fleming will summarise the arguments made in Auschwitz, the Allies and Censorship of the Holocaust. The second part of the talk will focus on how historians have responded to information received in Britain about the systematic killing of Jews taking place at Auschwitz during the Second World War.